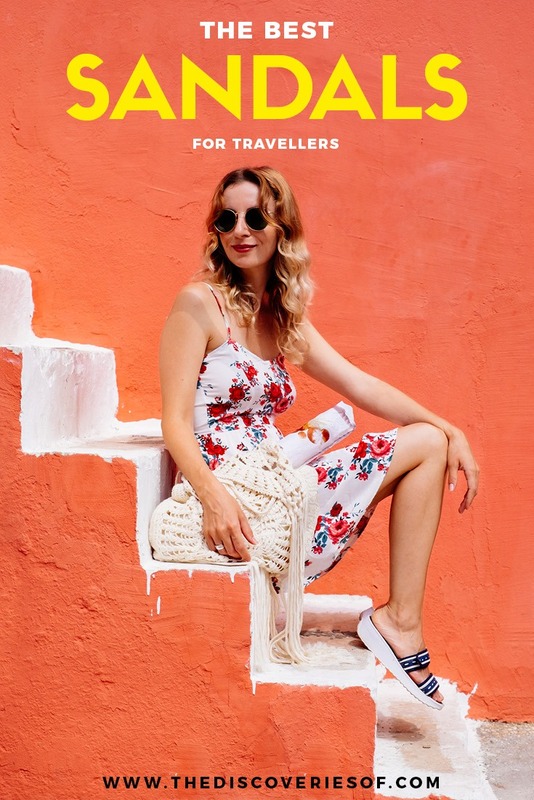 Best Walking Sandals for Women 2019 – The Discoveries Of. Finding good hiking sandals can be a difficult task. But when you’re on the trail or walking for long periods of time, you need a pair of sandals that are up to the job. I’ve rated and reviewed the best walking sandals for women for 2019. Keen is a big name in the walking sandal world – no doubt thanks to their reputation for comfort and durability. Clearwater Leather CNX Sandals combine supportive, shock absorbing soles with an adjustable strap for the perfect fit and all-round feel. The Clearwaters are the perfect overall walking sandals for women. They’re comfortable enough that you can wear them all day without thinking about it but also durable enough to wear hiking. The closed toes help to prevent any stubbed digits while you are on the trail. Underfoot support comes in the form of contoured arches and a stability shank. Even so, the Clearwaters are still incredibly light. The grippy soles help you stay steady on slippier surfaces too. On the top, the waterproof leather upper can be customised to fit your feet by way of a bungee cord lace system. This ensures a consistently snug fit without any chafing or rubbing. Sizing can come up on the small side. Teva Terra Fi Lite Sandals are so light, flexible and comfortable that you could be forgiven for forgetting you have walking sandals on at all. But don’t let the comfort fool you. These sandals are some of the toughest out there – with the additional benefits of great foot support with shock absorbing soles. The polyester webbing straps have the dual benefits of being lightweight and drying quickly if you get them wet. They’re also easy to slip on and off, but hold the sandals in place with their customisable fit, so no slippage and chafing. Plus the fully synthetic upper means these can be classified as vegan walking sandals. The rubber sole grips well. Teva’s Spider Original rubber is designed specifically to provide grip and traction, and that’s what it does. The Microban antimicrobial technology is a big plus – helping to stop the shoes from getting smelly if you get them wet. Really lightweight – perfect if you are travelling light or walking long distances. Open toe box – easier to stub toes if you are hiking on the trail. Ecco excel in making comfortable and supportive footwear that is good for your feet. With that in mind, it shouldn’t come as a surprise that they have created some of the best sandals for walking long distances that are available on the market today. Off Road Athletic sandals are extremely well made. Ours aren’t showing any signs of wear or tear even after extensive time on the trail. They offer great foot support – one of the key considerations if you are planning on wearing sandals while on the trail. What’s more, they have great grip and traction on pretty much every surface we’ve tried them out on. The RECEPTOR technology is designed for all round stability and support. The sole’s soft microfibre cover is extremely comfortable underfoot but doesn’t rub, even when it’s wet. Overall, if you prefer a more robust walking sandal for long-distance hikes without sacrificing any of the comfort, the Women’s Off Road are a great choice. Love the microfibre coating underfoot – very comfortable. Quite a narrow fit – can be difficult if you have wide feet. Merrell Women’s Siren Strap Sandals pipped the others to the post. Why? The waterproof nubuck uppers provide just the right balance between support and flexibility, while the dual-density midsole is exactly the kindness your feet need to get them through a long day on the road or on the trail. They’re complemented by air cushioning on the heel for shock absorption and stability, heel centring technology and maximum grip underfoot. The arch support on the Siren Straps is good enough for most feet, but not to the point that it feels uncomfortable. That said, you might want to look elsewhere if you’re flat footed and need a lot of arch support. Fully adjustable – good for narrow feet. Sizes run on the large side. Try before you buy. Toe gripper ridges slightly too prominent. Teva Tirra offer a beefier option than the Terra Fi Lite listed above. With more strap support, they’re a good choice for people who want a pair of walking sandals that can deal with long days on the road but are still quite sturdy. You can tell that Teva sandals are made to deal well with getting wet. This is particularly practical when you are travelling in hot climates and are not sure what to expect on your hike. They’re lightweight and breathable, dry fast and don’t rub underfoot. Our only quibble with the Teva Tirra sandals is the ankle strap, which did start to rub after a long day on the trail. Others haven’t had this problem though, and they’re still our sandal of choice for hikes through wetter terrain or water use. Dry fast and microbial technology stops them from smelling. Ankle strap can rub after a long day. Need more proof? Each sandal is quality checked over 200 times before it’s dispatched for sale. Exactly. With its breathable nubuck upper and EVA midsole, the Capri is the classic combination of durability and snugness needed for a comfortable walking sandal. The straps are fully adjustable. They’re also lined with neoprene, which aids circulation and helps prevent them from rubbing. Faultless build quality. Made to last. Pliant underfoot – not suited to really tough trails. Fitflop Lulu sandals. These are walking flip flops that are made for long days in the city, not in the forest. But if you are looking for comfy flip flops for walking, the Fitflop Lulu is a good option. The problem with most flip flops is that they don’t absorb shock and they rub the spot between your toes after more than about a minute’s wear. The Lulu does away with both of these problems with a cute but practical design and the famous microwobbleboard midsoles. The leather uppers and lining help to stop your feet from sweating, while the midsoles are comfort redefined. The cushioning can take a bit of time to get used to. Once you do, you’ll start to wonder how you ever wore another pair of flip flops at all. If we’re honest, most walking sandals are not that pretty. Practical yes, comfortable, heck yeah, pretty… no. Birkenstock has been creating sandals that are nice to your feet and to your eyes since 1774.
are the brand’s most popular design – for good reason. They’re stylish, comfortable and available in about a million colours from shiny gold to understated black. The adjustable straps help achieve a secure fit up top. The moldable sole and raised grip also combine to create a level of comfort you rarely find in everyday shoes. Like the Fitflop Lulu, these are firmly in the category of everyday sandals. You’ll need something more robust for the trail. They’re not waterproof either and tend to rub after being fully immersed in water on a couple of wears. What they are is the most comfortable flip flops for walking you will find for city use. The Arizonas also get full bonus points for being pretty good looking to boot. Uncomfortable if you get them wet. Walking sandals offer more ventilation than hiking boots or hiking shoes but the level of ventilation differs between models. Walking sandals should be lightweight, which makes them the perfect shoes for travellers. Just make sure you’re not sacrificing comfort either. There are a growing number of waterproof walking sandals on the market, which can be handy if you are unsure of the terrain or plan on walking in wetter areas. Check to see that the sandals come with antibacterial protection to help prevent them from getting smelly. How much underfoot support do the sandals provide? Walking sandals with arch support are pretty much standard across the board, but the level of support differs. Flat footed people will want more foot support, while others might not require firm support. What do you want to use the sandals for? If you’re simply looking for a comfortable option for long days of walking around in town, you may find that a comfy pair of flip flops for walking will be adequate. If you’re planning on hitting the trail, you will almost certainly need a pair of proper walking sandals with more technical features to help provide support as you hike. Hiking sandals should not be used for hill walking as they don’t offer any ankle support. No two feet are the same. The general rule of thumb is that the more adjustable a pair of walking sandals are, the more likely you are able to get a comfortable fit for your feet. Your feet should remain in place while you are walking, straps shouldn’t rub or be too tight. One of the biggest benefits of walking sandals over standard sandals or flip flops is an enhanced level of cushioning, helping to protect your joints from shock and providing you with stability as you hike. Uppers are made from leather or synthetic materials. There are pros and cons to both. Synthetic materials perform better in wet conditions as they dry quickly and don’t tend to rub if wet. Leather can provide a more comfortable grip and is naturally quite breathable. Most leather walking sandals have a synthetic lining to help make them more water resistant but they’re still not as efficient in damper conditions as synthetic uppers.